It’s the last day of the month now, and my Academic Writing Month of 2013 is drawing to a close. I thought I’d reflect here on how it’s gone, and lessons I’m taking from it for the future. This year I had fairly modest goals. Last year I had more goals, but this year I had two main ones: finish revising an academic journal paper that’s been lingering since the summer, and write and submit a conference paper proposal (CFP deadline 30th November 2013) for a book history conference next year. Although they were just two goals, they were big ones. The journal paper was about 10,000 words long, and needed quite significant revisions before resubmission, and that couldn’t be done in a hurry. Equally the conference paper proposal was slightly outside my comfort zone, so I needed to familiarise myself with existing research and writings, before selling my pitch. I’m pleased to say that both goals were achieved. The conference paper proposal was submitted mid month, and the revised journal paper resubmitted towards the end of the month. I started tackling both of them as the month started, and nibbled away at them, working steadily, as and when I could, until both were finished. So that was really good, and a big result of AcWriMo for me. Another goal that I added part way through the month was related to my Melrose one-place study, and this was to put a person index, about 9000 persons (names, occupations, addresses, any relatives recorded) who were involved with the Melrose regality (local) court between 1657 and 1676. Although this was primarily a genealogical index it arose from my MPhil dissertation research a decade ago. Again I’m pleased to say this was done, and I blogged about it here. More minor goals included judging the IF Comp games this year (done, at least 10 of them played, judged and rated), and to move my own text adventure writing project onwards (done: lots of player interaction added and coded up). I also wanted to move on my urban history research, and immediately after I resubmitted my journal paper I started planning a new one, that develops considerably on just a couple of sentences in my PhD thesis, combining book history and urban history in rather a nice mixture. It’s early days, but I will be able to take this forward in the coming month or two. One thing I didn’t manage was to write any more of my roleplaying / history crossover articles which I am building into a book. But that’s ok, this month was primarily for academic writing projects, and I can tackle that next month. In December I will also be doing another piece of less formal writing: analysing and reviewing the Sapphire & Steel annual for my third article for an upcoming fanzine about the series. Fun. So overall it’s been a very successful month for me. Although I set myself slightly more modest goals than last year, at least in terms of number and quantity, they were individually ambitious and time consuming, and it’s a big achievement to have managed all the big ones. This helped me finish one project that had been hanging around for too long, finish another that was urgently time critical, and set myself up for the next research project and journal paper I’m working on. And starting working on the AcWriMo projects from the beginning of the month, and blogging my progress week by week, got things done. I never spent a huge amount of time in the week on any one project, but kept working steadily at it, and that way progress was made, and things finished. All going well I definitely intend to take part in AcWriMo 2014. Looking forward to it. In the meantime I hope to continue the momentum I have built from this year. I’m doing another one of my occasional posts here about things I’m working on research and writing wise. I find these useful for my own purposes to keep a note of what I’m up to, and I’ve found that declaring goals somewhere like this can be helpful for getting things done. I’m planning on taking part in Academic Writing Month again this year, in November, but probably in a more low-key way than last year. I have a particular goal for the month, to get a revised journal paper completed and sent on to the relevant editors before the end of November. But that’s probably my main goal for then. I need to finish some relevant reading for that, as well as work on the paper directly. So I need some thinking time, before doing my final revisions. Beyond that I want to focus on doing things I find fun. For example, inspired by my much missed late PhD supervisor, I want to return to urban history research, and am planning a variety of things I can get started with. I have a number of ideas for academic urban history things I can do from home using both trade directories I have access to in digitised form and the detailed 18th century Scottish tax records available online at Scotlandsplaces. 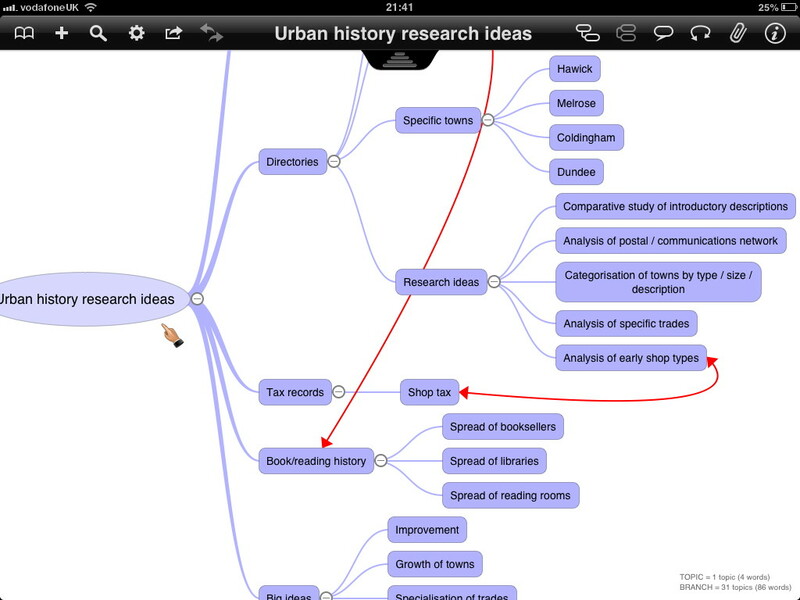 I’ve been jotting down ideas for research possibilities in a mind map on my iPad. All would be fun to research, and could potentially lead to more academic journal papers. I also want to carry on with my series of crossover history and roleplaying game articles, which I’m planning to compile into a book once I’ve written enough. I completed my 10th and 11th articles for this the other night, and now have the challenge of figuring out which places to write about next. I’ve generally been writing about two Scottish places for every one English place. To be honest I’m impressed I’m managing to write that much about England, ranging from Northumberland, down to Suffolk, and over to Somerset and Cornwall. I like writing these pieces, and find them enormous fun. And I really must resume my text adventure work in progress. Though I could argue I’m doing research for it at the moment, because I’ve just started reading Rosemary Goring’s After Flodden, a novel set in the same area at about the same time as the interactive fiction game I’m writing. Hopefully it will help inspire me and give me more of a feel for the time, which I need for continuing developing the plot and interaction side of my game. Writing text adventures in Inform 7 is enormous fun – like playing them, not like conventional programming – but I find the more traditional aspects of writing harder. Another to-do list for my own benefit. I find it helpful to make a note of things in progress, not least because it gets my thoughts and plans in order, and records it somewhere I can find it again in future. My immediate priority is to write a talk for an academic conference in a month’s time. I’m speaking about my taught postgraduate Masters dissertation research into Melrose regality court records of the late 17th century. I did this research a decade ago, and have completed a part-time PhD on a quite different topic since then. So it is a little bit distant for me now, but I should be able to prepare it well. Actually squeezing it into 20 minutes is something of a challenge, but will be fun, and I hope the audience will enjoy it. I gave a longer talk (about 90 minutes) about the same research in Melrose years ago, and that proved popular. Alongside that I have a revise and resubmit offer on a journal paper based on this Melrose research. I should get on with that, and perhaps tackling the journal paper revisions alongside the talk writing might kill two birds with one stone. I’m aiming at quite an ambitious journal. They may yet decide to reject me, but things are promising at the moment, and I always regard a revise and resubmit offer as a good one that must be followed up on. Basically you have your foot holding the door open, and it would be silly not to try to get to accepted. Another priority for me is to write my talk for the Guild of One-Name Studies regional meeting at Perth in just over a month’s time. I’m going to be talking about my Cavers one-name (surname) study, which I’ve been doing since the late 1980s, and has been registered with the Guild since the late 1990s. We can use PowerPoint at this meeting, as I will do for my Melrose talk, and I’m hoping to cover a lot of ground that will be of interest to other Scottish one-name studiers. My planned book of strange history / roleplaying articles continues, slowly. I tend to lurch at the articles: have a gap for a while, and then complete three or more in quick succession. I’ve completed nine so far, and have two more well underway. I am aiming for fifteen completed ones, and will then see if I want to write more. Lurching my way forwards anyway. My text adventure game is on hold, but I should resume it in the autumn. I’m in the middle section of the game now, and am still writing the core plot. The coding side of things (in Inform 7) isn’t that difficult. But writing the detective story side of things is more of a challenge for me, and is being done slowly, and carefully. And I continue to blog, in my various blogs. For example I blogged earlier today about my husband’s turkey poaching ancestors, inspired by a very similar case covered in this week’s Who Do You Think You Are programme (UK version).